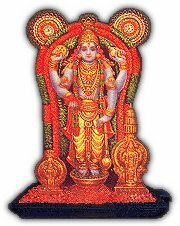 History of Guruvayoor Temple is said to be dates back to Dwaparayuga when krishna is supposed to have told his foremost disciple Udhava to reinstall the idol of Lord Vishnu which he had installed at Dwaraka. The place was to be chosen by Guru Brihaspathi. Krishna promised Udhava that a true devotee can feel his presence in the idol. Collecting the idol from the submerged Dwaraka Brahaspathi and Vayu travelled all over India and with the help of Parasuram located a lake full of lotus flowers in Kerala. The lake was the abode of Lord Siva and Parvathi who moved to Mammiyoor for making place for Vishnu. As Guru and Vayu together installed and founded the temple, the place came to be known as Guruvayupuram. The lord is supposed to have chosen the image of little Krishna (Unnikrishna) at the temple of Guruvayoor. The sub deities worshiped are Ganapathi, Sastha and Bhagavathi. The four armed idol carrying Conch (Sanka), Discuss (Chakra), Mace (Gadha), Lotus niched out of a stone called "Pathala Anjanam" stand gracefully at the Sanctum Sanctorum as a manifestation of Almighty himself ever so merciful to ignorant multitudes. The history of the idol is said to be as follows. At the beginning of the first Kalpam named Brahmakalpam, Mahavishnu gave Brahma an idol and the first book of Bhagavatham. Brahma, later gave this idol to the Prajapathi Suthapassu and his wife Prishni and Lord Maha Vishnu took incarnation as their son. This couple in their next birth were known as Kashyapa and Aditi. They got possession of this idol in that birth also, and Lord Maha Vishnu was again born as their child, the Vamana. The next birth of this couple was as Vasudeva-Devaki and the story repeats. This time the incarnation of Lord Maha Vishu was as Lord Krishna, the most complete man. 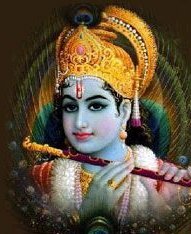 Lord Krishna, when he built the city of Dwaraka, built a temple for this idol. Before his death, Lord Krishna entrusted Udhava with this idol and asked him to meet Brihaspathy, the Guru of gods. The Guru along with his desciple Vayudeva (god of air), found a place which was recommended by Lord Paramashiva. Thus the Guru and Vayu installed this deity and Paramashiva named the place as Guruvayoor. And the deity is now known as Guruvayoorappan. The idol is carved out a stone called 'Pathala Anjana Sila' and is utmost sacred. The place selected for the installation was suitably sacred by the presence of Lord Shiva. The place was already sacred owing to the presence of Lord Paramashiva. He was worshiping Lord Maha Vishnu under the waters of the 'Rudratheertham' (the sacred pond near the temple). Later, Lord Shiva emerged out of the waters when the Prachethas, son of King Pracheenabarhis came in search of a place to worship Lord Maha Vishnu. He then revealed the hymn 'Rudra Geetha' to Prachethas And then the Prachethas worshiped Lord Maha Vishnu for another ten thousand years staying in the 'Rudratheertham' After the installation of the idol of Mahavishnu by Guru and Vayu, Lord Shiva moved to the nearby Mammiyoor temple. According to the stories, Shri Aadi Shankara who is believed to have extra ordinary powers was once travelling by air from Kalady to Shringeri. Even he, who never believed in the worshiping of idols, was forced to come down while crossing Guruvayoor. To appease Guruvayoorappan he worshiped the deity by eight 'Shloka' (four lines of poetry). This is now known as the 'Govindashtakam'. He then spent 41 days worshiping Guruvayoorappan. The daily rituals of worship during the Mandalam period were conceived by Shri AdiSankara at that time. Near past history is as follows. The temple was renovated by a Pandya king somewhere around 500 years ago. In 1970, in a fire accident, almost all the temple except the Shreekovil was destroyed and the temple was reinstated in its shape in 1971. The temple is not very big compared to some other well known temples. The Gopuram on the eastern side is 33 feet and that on the western side is 27 feet tall.